Hi, I'm Evie aka MintyGurl! I'm brand new on here and still trying to find my way around. The main reason I've joined this forum for the awesome MLP content!! This is my first time being in a MLP community, so I'm pretty excited to talk to fellow collectors! I've been a pony fanatic ever since I was 2 or 3. Since I grew up with G3, it's always been my favorite MLP gen. But don't get me wrong, I love all the other gens too! For the past year, I've gotten serious with collecting MLPs. I mostly get G3's but I have also gotten some other gens also! So far, I have about 100 of 'em and around 70 of them are from when I was younger (yeah, I was a little spoiled...heh heh...) Also, if you couldn't already tell from my username, my favorite pony is G3 Minty! 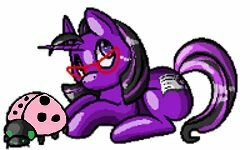 A few of my other hobbies (excluding MLP collecting and restoration) include drawing (really anything artistic though), nail art, and making cheesy videos with special effects on iMovie. Hello Evie! It's a pleasure to meet you. Sounds like you're quite passionate about those cute G3s. Reading how many ponies you have now...you're obviously a dedicated collector, which is very cool. I can only dream of owning that many ponies one day. See you around! Hullo Evie! It's so wonderful to meet you. I love your avatar (I'm assuming it's your art) and would love to see more of your drawings! It's absolutely adorable. Sounds like you have a terrific collection! Feel free to show it off if you wish. We're nosy and love seeing everyone's good stashes. And Minty is a tie with Pinkie Pie for my favorite-est-est Ponies ever, so you're obviously a person with very good taste. If you need anything, just let us know! We're eager to help! Its very nice to meet you. I feel G3 Minty is a huge favorite for a lot of collectors. Minty in all the generations is popular. So glad you joined us. I have noticed we are getting a lot of new members who grew up with G3 so, I am sure you will really enjoy the forum. Would love to see photos of your ponies. I collect G1 mainly but I have a ton of G3's. I am almost afraid to admit how many. I have a problem lol. My favorite G3 is Port-O-Bella. Welcome to the herd! We are all one big crazy bunch of friends here. Welcome! I'd love to see pictures of your collection if you ever get the time.